Back in the day of the cowboys and Wild West, weddings were quite simple. Usually the party consisted of your family and neighbors bringing a covered dish to an outdoor picnic with red and white checkered tablecloths. What you may want to know before choosing a western bridal dress. Most western bridal dresses were tea length or just above the ankle in length and did not touch the floor. Some had tapered handkerchief hemlines. Remember, there weren't any paved streets and the bride might have to get on a horse to travel to her destination. The above v-shaped neckline has princess seams and is trimmed in Venise Lace. It has a tapered eight point skirt with a six inch border fringe. Back in the Wild West, brides choose dresses that had lots of lace and fringes. The above dress has a slight off the shoulder neckline with delicate intricate beading followed with long fringe to accentuate the shoulder. The fitted bodice of embroidered silk is bias-cut to flatter the figure. The flared cotton lace skirt comes to eight points over a full lace ruffle. This is a beautiful dress and perfect for a summer celebration. 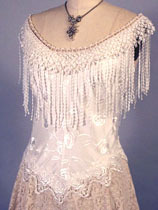 Buttons were more popular than zippers for a western type wedding dress. This very feminine beautiful outfit is made of embroidered tulle, lined with silk and finely finished with delicate Venise laces reminiscent of antique tatting. The little dainty buttons close the dress in the front. This dress has a slight train in the back making the dress even more stunning. If your choosing a short or spaghetti strapped dress remember to have a shawl or some shoulder covering for cool evenings. Notice the beautiful Venise trim, appliqués and fringe at the bottom of the dress. Lace was very popular for a western gown; so much so that whatever type of material your gown is made from you will want lots of lace. The above dress has an empire style duster made of English lace with elbow length sleeves. The train extends about eighteen inches beyond the hemline. 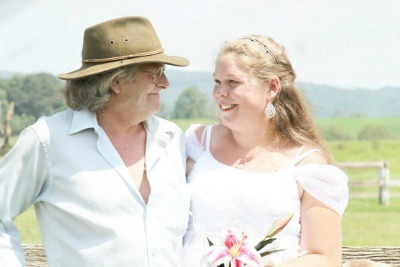 <ul> <li>Using a cowgirl white hat and veil draping from the bottom of the hat along with white laced boots (see first picture) will add a sense of the Wild West to your bridal ensemble. This beautiful bride walked in an open field to a gazebo where her honey was awaiting her arrival. How about the above western wedding dress with a cowgirl hat instead of a veil? Some of the dresses on this page are from Martin McCrea. They have a western wedding dress to make the most discriminating bride happy. Check them out and let me know your thoughts through my contact form on my Navigation bar. Still have questions? Ask away using my contact form on my Navigation bar. Additional tips and thoughts can be found here.